This review is like whoa, LONG OVERDUE. Actually, a blog post in general is long overdue. So many things going on, so little time–the usual excuses. But I do plan on jumping back into the blogging saddle (ouch?) soon! How can you talk about something that you can’t remember? Before the ski trip, Cassidy “Sid” Murphy was a cheerleader (on the bottom of the pyramid, but still…) and a straight-A student, with two of the best friends a girl could ask for. When Sid finds herself on a ski lift with hunky local college guy, Dax Windsor, she’s thrilled. “Come to a party with me,” he tells her, but Dax isn’t what he seems. He takes everything from Sid-including a lock of her perfect red curls-and she can’t remember any of it. Witty and poignant, Colleen Clayton’s debut is a stunning story of moving on after the unthinkable happens. First off, you should know–this book made me cry. When Sid finally comes clean, at the end…BIG. UGLY. TEARS. Clayton got to me, and in a way that I didn’t feel was manipulative at all, but authentic. Huge kudos for that! I really connected with Sid. 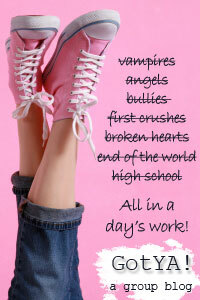 I love the character Clayton created–a real girl with real friends. At the beginning of the book, she’s far from the media-dictated ideal in terms of body shape, and she’s mostly okay with that–BRAVO. When her attitude does change, her quest to shed her bountiful curves is driven by an out-of-control urge to hide from male attention, and her reasoning feels scarily–and heartbreakingly–real. As for the love interest, Corey? He’s wonderful. Patient, funny, caring. Misunderstood, but not in that typical bad boy way. I haven’t seen many love interests in young adult fiction like him, and that’s a shame. The way Corey respects and cares about Sid is a fine example of a healthy teen relationship. I loved how this was an “issue book” at heart, yet Clayton added enough lightness that it didn’t feel bleak. I loved how even though Sid was clearly struggling with something huge, that she could still find moments of joy–not every second was grim. To sum it up: Clayton tackles a pair of tough issues and handles them with honesty, poignancy, and yes, even humor. I would recommend this book to virtually anyone. 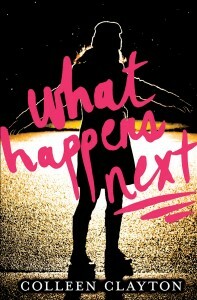 What Happens Next is available at a bookstore near you!